Industrial control system (ICS) is a collective term used to describe different types of control systems and associated instrumentation, which include the devices, systems, networks, and controls used to operate and/or automate industrial processes. Depending on the industry, each ICS functions differently and are built to electronically manage tasks efficiently. Today the devices and protocols used in an ICS are used in nearly every industrial sector and critical infrastructure such as the manufacturing, transportation, energy, and water treatment industries. There are several types of ICSs, the most common of which are Supervisory Control and Data Acquisition (SCADA) systems, Distributed Control Systems (DCS), Local operations are often controlled by so-called Field Devices that receive supervisory commands from remote stations. SCADA is not a system that can provide full control. Instead its capabilities are focused on providing control at the supervisory level. SCADA systems are composed of devices (generally Programmable Logic Controllers (PLC) or other commercial hardware modules) that are distributed in various locations. SCADA systems can acquire and transmit data, and are integrated with a Human Machine Interface (HMI) that provides centralized monitoring and control for numerous process inputs and outputs. The primary purpose of using SCADA is for long distance monitoring and control of field sites through a centralized control system. In lieu of workers having to travel long distances to perform tasks or gather data, a SCADA system is able to automate this task. Field devices control local operations such as opening or closing of valves and breakers, collecting data from the sensor systems, and monitoring the local environment for alarm conditions. SCADA systems are commonly used in industries involving pipeline monitoring and control, water treatment centers and distribution, and electrical power transmission and distribution. This is a system that is used to control production systems that are found in one location. In a DCS, a setpoint is sent to the controller that is capable of instructing valves, or even an actuator, to operate in such a way that the desired setpoint is maintained. Data from the field can either be stored for future reference, used for simple process control, or even used for advanced control strategies with data from another part of the plant. Each DCS uses a centralized supervisory control loop to manage multiple local controllers or devices that are part of the overall production process. This gives industries the ability to quickly access production and operation data. And by using multiple devices within the production process, a DCS is able to reduce the impact of a single fault on the overall system. A DCS is also commonly used in industries such as manufacturing, electric power generation, chemical manufacturing, oil refineries, and water and wastewater treatment. 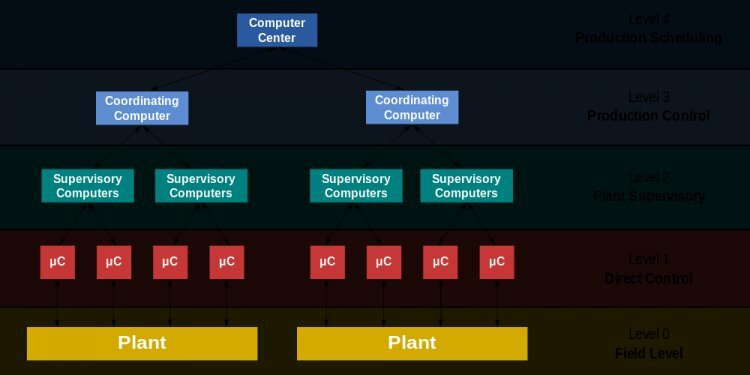 Implementing an ICS environment may often be a hybrid of DCS and SCADA wherein attributes from both systems are incorporated. The convergence of IT and OT provides enterprises greater integration and visibility of the supply chain– which include their critical assets, logistics, plans, and operation processes. Having a good view of the supply chain helps organizations remain competitive. On the flip side, however, the convergence of OT and IT allows easier access to these two components that are targets of cybercriminals. In many organizations OT infrastructure is at best poorly protected against cyber attacks. This is a type of hardware that is used in both DCS and SCADA systems as a control component of an overall system. It also provides local management of processes being run through feedback control devices such as sensors and actuators. In SCADA, a PLC provides the same functionality as Remote Terminal Units (RTU). In DCS, PLCs are used as local controllers within a supervisory control scheme. PLCs are also implemented as primary components in smaller control system configurations. An RTU is a microprocessor-controlled field device that receives commands and sends information back to the MTU.